U.S. Coast Survey Sketch C Showing the Progress of the Survey in Section No. III from 1843 to 1857. 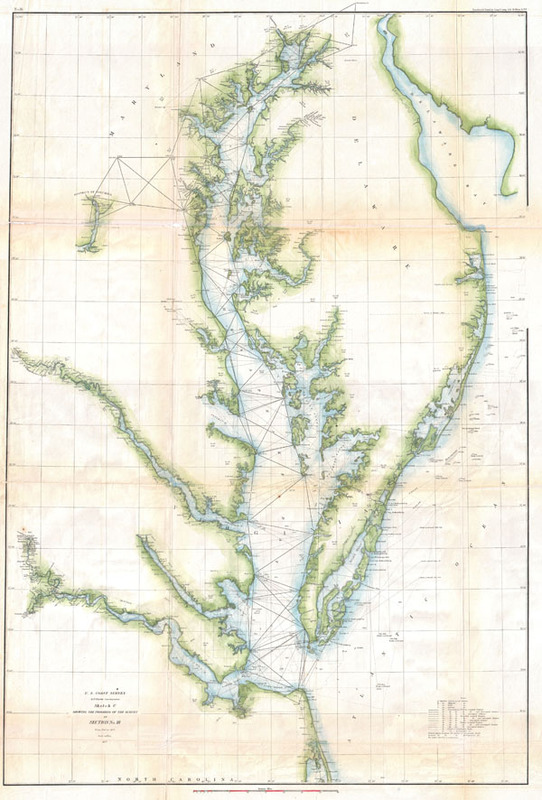 A beautiful preliminary triangulation chart of the Chesapeake Bay area published in 1857 for the U.S. Coast Survey Report. Covers from the entrance of the Bay at Cape Henry northward to the entrance to the Susquehanna River. Extends eastward to cover the Delaware Atlantic Coast and Delaware Bay. Extends westward as far as Richmond, Virginia and the District of Columbia. A spectacular regional map. Very good condition. Minor discoloration and reparis along original fold lines - especially at fold intersections. Blank on verso.